Modifiers | What are Modifiers? A modifier is a word, phrase, or clause which functions as an adjective or an adverb to describe a word or make its meaning more specific. Modifiers can play the roles of adjectives or adverbs. When a modifier is an adjective, it modifies a noun or a pronoun. (In these examples, the modifiers are shaded, and the words being modified are bold). Lee caught a small mackerel. Lee accidentally caught a small whelk. Lee caught an incredibly small mackerel. Lee supposedly accidentally caught a small whelk. Lee caught a mackerel smaller than a Mars bar. Lee caught a mackerel of tiny proportions. Lee caught a mackerel which was smaller than a Mars bar. When alone, Lee tried to catch mackerel. When we left him alone, Lee set up his rod to catch mackerel. 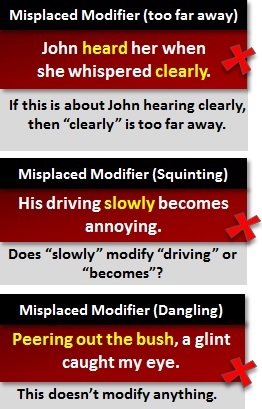 As shown by these examples, a modifier can come before whatever it modifies (called a premodifier) or afterwards (called a postmodifier). Read more about adjective phrases. A modifier is best placed alongside whatever it's modifying. If your modifier is too far away, it could lead to an ambiguous or wrong meaning (first example below). Also, be aware that occasionally a modifier might feasibly modify two ideas in the same sentence (second example). Also, it is a very common mistake (believe it or not) for the thing being modified to be missing from the sentence (third example). Read more about misplaced modifiers. Read more about squinting modifiers. Read more about dangling modifiers.